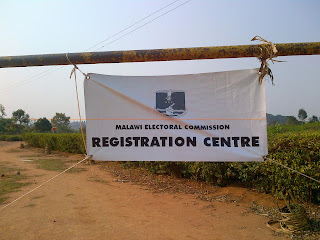 The Malawi Electoral Commission is informing the public that the seventh phase of voter registration will run from November 1 to 14, 2013 and will cover Lilongwe, Likoma and Nkhata Bay district councils. The Commission is informing all political parties and civil society organizations that training of registration clerks will take place on Thursday, October, 31, 2013 in all registration centres covered under phase seven. All political parties and civil society organizations are encouraged to inform their monitors to observe these training sessions in the centres they will be monitoring. This will give them an opportunity to appreciate the registration process and enable them to monitor registration effectively. All political parties and civil society organizations are reminded that they are supposed to place two accredited monitors per registration team who may alternate. Should there be any need for clarification contact Mr Sangwani Mwafulirwa on 0 999 274 304 or email smwafulirwa@mec.org.mw . Today we are meeting as the task force on preparations for the presidential candidates’ debates and I wish to welcome you all. I understand that this is the third meeting and may I commend you for the ground work that you have already done. Distinguished members, I have been informed that you have already formed sub-groups on specific tasks which are Coordination, Resource Mobilisation, Stakeholders Engagement, Issue Generation and Debate structure/format, hosting and programming. I am also informed that NAMISA has done some ground work as well. I wish to encourage you to share with this taskforce and come up with one best product for our mother Malawi. Distinguished Members, the Commission would like to see all the efforts concentrated and directed towards this initiative be coordinated by this taskforce. Distinguished Members, This will be the first time the country will hold presidential debates and wherever the history of this first debate will be recited, your names will be mentioned also. None of us would want our names to be associated with a fiasco of a debate. I, therefore, challenge you, Distinguished Members, to put all your efforts and energies into the organisation of this debate. Distinguished Members, as a Commission we understand that this is the busiest time in the electoral calendar but I assure you that we shall always be present for the meetings of this task force. I also implore you to do the same, try to avoid situations where you have to delegate down wards your attendance to the task force meetings. In some instances delegation affects implementation of activities because coordination and collaboration can be disjointed if the composition of the team like this one keeps on changing every time there is a meeting. Ladies and gentlemen, allow me to say something about why the Commission thought of holding presidential debates. Those of us who have followed previous elections will remember that we used to have candidates debates at parliamentary level. They brought a lot of excitement to candidates and the electorate. We are grateful for our stakeholders that have come in to express interest to conduct debates for parliamentary and local government elections candidates. We would urge as MEC that you ensure there is coordination. There should be a mechanism of ensuring even geographical distribution of the debates. There should not be high concentration in some areas while others are starving. There should be a good mix up of the rural and urban areas especially on the local elections. Temptations can be high to concentrate the debates in the urban and other easy-to reach areas but let us do our best to avert this situation. Ladies and gentlemen, the Commission expects more excitement for the presidential debates but we have to work for this. This will be the only forum provided to the electorates to compare policies and views of all presidential candidates on a single platform. This will go a long way in helping them make informed decisions. Therefore, we need to plan and execute the presidential debates in a manner that is attractive. Distinguished Members, we are lucky that other countries have done it successfully before us and we can learn from them. We should applaud NDI who have already indicated that they might bring an international expert on presidential debates to help us in capacity building. If there are countries holding elections sooner than us, it would be prudent, funds permitting, for some members to go on a study tour just to learn from them. There also other countries, like Kenya, which have had Presidential debates. This is an area we can learn from. We cannot reinvent the wheel but definitely we can modify to suit our context. With these remarks, Distinguished Members, I have the honour to declare this taskforce meeting opened. The Malawi Electoral Commission is informing the public that for the sixth phase of voter registration, centres will close to the public at 4PM on Monday, October 28, 2013. However, registration centres that failed to open on the first day of registration, 14th October, 2013 or any other day during the registration period will have an extension equivalent to the period they were non-operational. All persons who have not registered in the areas covered under phase six are encouraged to present themselves for registration before the closing time. The Commission is advising all registration staff that all registrants who cannot be processed by close of business on Monday, October 28, 2013 should be recorded and processed on priority on Tuesday. Please take note that this applies only to those who will present themselves for registration before 4pm on Monday, October 28, 2013. Meanwhile, the Commission is informing the public that the seventh phase of voter registration will run from November 1 to 14, 2013. This phase will cover Lilongwe, Likoma and Nkhata Bay district councils. Should there be any need for clarification or further information contact Mr Sangwani Mwafulirwa on 0 999 274 304 or email SMwafulirwa@mec.org.mw . Of the total registered voters in fifth phase, 379,420 are men representing 43.03 percent while 502,380 are women representing 56.97 percent. The total of registered voters for all the five phases is 3,759,602 voters. There were some logistical challenges faced in phase five to the extent that some centres could not open for a full day in Ntcheu, Mangochi and Dedza. The Commission provided for an extension at the end of the phase equivalent to the period the centres were non-operational. Detailed registration figures for each centre, ward and constituency have been uploaded on MEC website www.mec.org.mw and at http://www.scribd.com/doc/177335405/Phase-5-End-of-Phase-Statistics-2014-TPE-FIN-SS. The Commission is urging stakeholders to exercise caution with the statistics because they are based on preliminary information captured during field operations. The figures may change during scanning, data quality control management and during voter verification as some people may transfer to or from other centres. Meanwhile the sixth phase of voter registration is in progress in Lilongwe City, Chitipa and Dowa districts, Mchinji South and Southwest constituencies and Dedza West, Central, Central East, Southwest and Northwest constituencies. This phase will end on October 28, 2013. The Commission is appealing to all political parties to ensure that they place monitors to monitor registration.